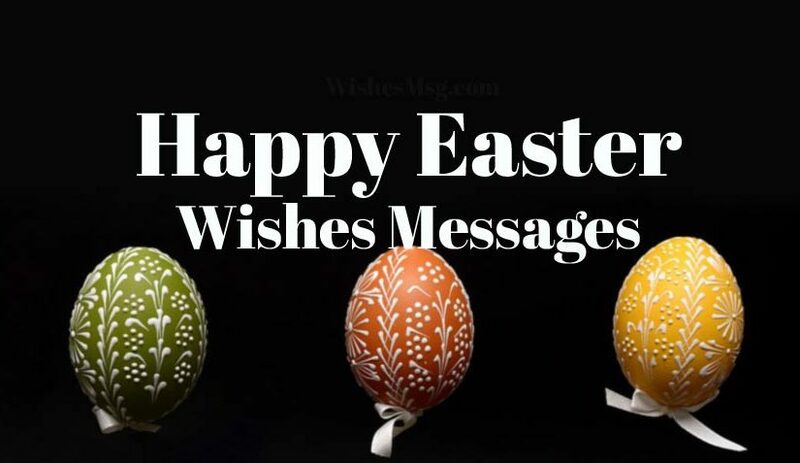 Easter Wishes and Messages: Easter Sunday is all about sending Easter wishes and messages, going to church, watching Easter parade, hunting Easter egg, and eating Easter foods. This is the holy occasion that spreads spirit among us. Let’s reach the positive vibes and love of Easter to everyone from your family, friends and relatives through Happy Easter wishes and messages. Here you’ll find best of best Easter greetings and Easter messages that symbolizes happy, joyful and full of fun Easter. You can choose your choice of heartwarming wording to write in Easter cards that you are going to send on this happy Easter day. Sending heartiest wishes on Easter. May you have happiest Easter holiday filled with joy, peace and so many Easter eggs. May the meaning of Easter reflect in your life and you along with your family experience the renewal of love and happiness! Sending my heartiest wishes on the holy Easter morning. May this Easter makes all your dreams come true and brings a lot of love, happiness and health to your family! May the lesson of Easter lighten your heart and the blessings of Lord’s are bestowed in your life always! Happy Easter Holiday. Happy Easter to you and your family. 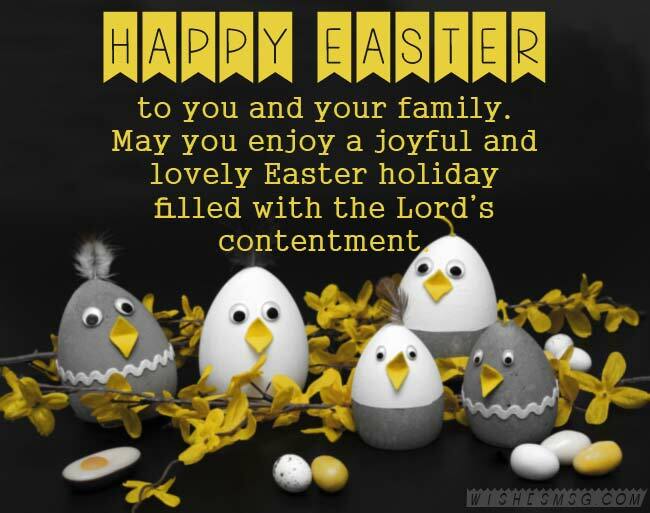 May you enjoy a joyful and lovely Easter holiday filled with the Lord’s contentment. Sending wishes for a happy Easter weekend. May God bless you and your family with unwavering faith and happiness on this year Easter! Happy Easter, my dear friend! With a wonderful friend like you, every day is a beautiful beginning. Happy Easter to a great friend. May your life receive a new light to walk in today and always! Easter is the day to be thankful for the precious gift of my life that God has gifted- Mom & Dad. Happy Easter to both of you. Happy Easter to the best Mom and Dad. Lord has given me everything as you’re my parents. May God grant all your wishes on this holy day! You’ve been always there to take care of me from the very first step to till now. Both of you is the blessings of God in my life. Happy Easter! Sending happy Easter wishes to the amazing parents. Nothing in this world is as precious as you two mean to me. All my love to you! 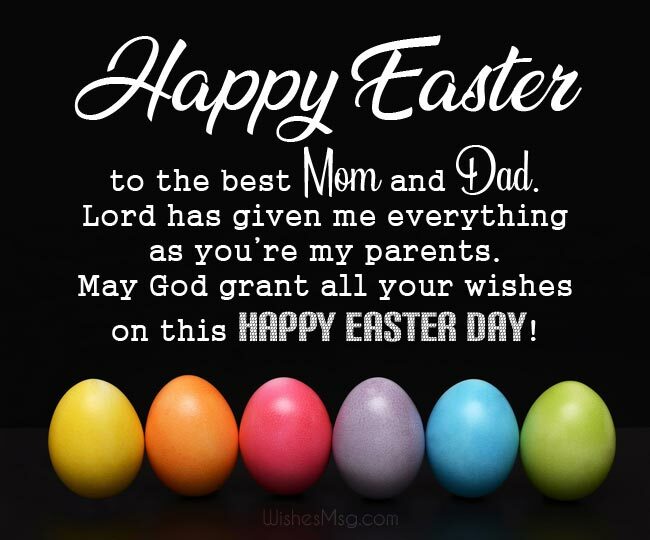 Happy Easter Sunday to you, Mom & Dad! Your love and support are the best of all the gifts I have this Easter. Happy Easter to the special Son! May God bless you with all the happiness and all your wishes and dreams come true! Happy Easter, dear! May you always keep smiling and be happy. Always be ready to embrace whatever comes to your life. Happy Easter to the amazing kiddo! God has sent happiness in our life as in your shape. May all the bliss of this glorious day be yours! Wish you a blessed Easter, honey! May the light of God shine on your way always and His wisdom helps you in your way! I think, for a change, we should celebrate with chicken instead of eggs this Easter! That would taste better. Happy Easter. The most interesting part of the Easter celebration is that a bunny lays an egg! Enjoy this occasion to the fullest. Happy Easter Sunday. Sending you colourful eggs and tasty chocolates on this Easter. Don’t eat them all alone, share some with others too! Happy Easter. Easter means a celebration with colourful eggs and bunnies. Wishing you an eggy-bunny-happy Easter! Praise Christ for He has defeated death and saved us all! Happy Easter! May the blessings of Christ shower on you, may you be surrounded with the joy and laughter of your near and dear ones on this day. Happy Easter. Time of mourning is no more. Rejoice is Christ’s Easter season. Happy Easter! Let all your dreams be fulfilled, may all the happiness you deserve to be showered on you. May Christ show you the right path. Happy Easter day. Easer is the time to remember the sacrifice made by Lord Christ and his unconditional love. Let us follow the right path shown by the Son of God. Happy Easter. Wishing you a renewed faith in life to strive harder for your goals and ambitions on this Easter Sunday. Through meadows, fields and forests Easter will come to our home And everything that died in autumn Will resurrect, grow and bloom! I wish that the Holy Easter morning bells and psalms bring hope, peace and good luck to our home. Let us open our souls for love, kindness and joy. Happy Easter! Wishing abundance of happiness and success in your life…. Wishing you the love of your dear ones…. Best wishes on Easter dear! 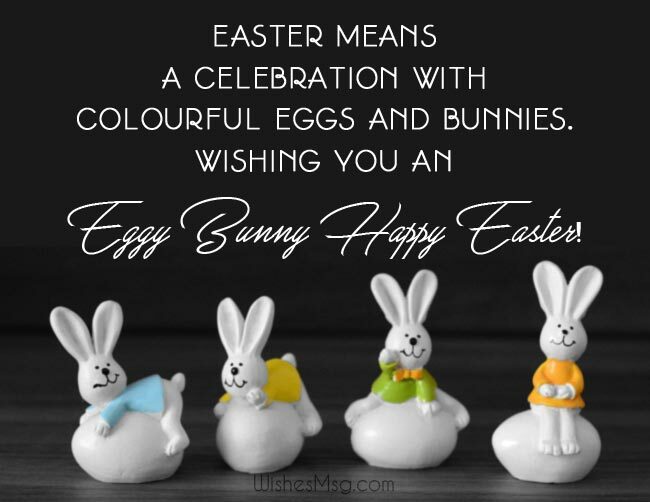 Easter is here and I wish that this occasion along bring along some beautiful times for you to create some amazing memories…. Happy Easter! May this Easter brings your family all together and fills with great celebration, joy, chocolates and happiness! Happy Easter, Sweetheart! Wish you a very happy Easter and hope that you have a basket overflowed with blessings and goodies! Sending you an Easter blessing. 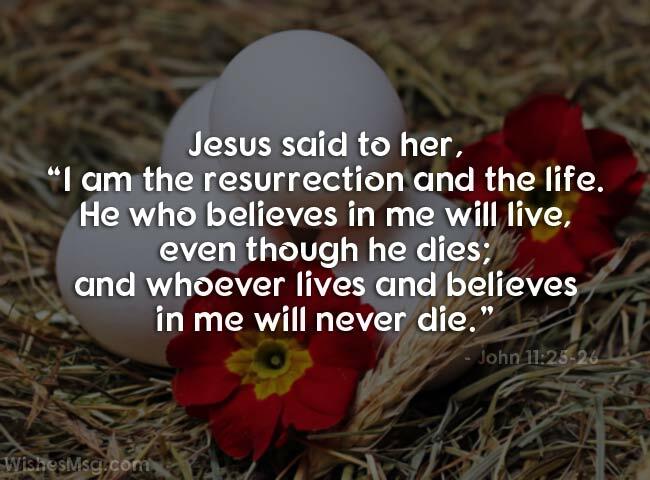 May the resurrection day of Jesus brings a miracle to your life and fill it with His love and blessings for eternity. Wishing you a joyful Easter holiday celebration. May the deep meaning of this holy occasion constantly remind you that God is always with us! Sending you heartiest wishes on this auspicious day. May God allow you a new beginning with great prosperity happiness and success! Happy Easter. If it weren’t for the beautiful Spring weather, I’d be distracted with that damn bunny for eating all my flower bulbs. Happy Easter anyway. Celebrate his resurrection with complete joy and contentment. Hope you get success and happiness in your life. Have a happy Easter. Spread the joy and warmth in your hearts to everyone this Easter. Hope this Easter brings promotion and success in your life. Wishing you a very happy and blessed Easter. If Jesus had known how much chocolate we’d be enjoying on Easter, He would have risen even sooner. Have a Delicious and Blessed Easter. We hope you liked our collection of Easter wishes and messages. These happy Easter messages will inspire your near and dear ones and would bring a pretty smile on their face. You can also send these Easter messages through e-mail, text messages and on Facebook. Whether you want to wish your parents, son, daughter, or kids, friends or any other relatives; these nice, but simple wishing messages are the best way to let your loved one know how much they mean to you. So let’s spread the joy and magic of Easter to everyone through these Easter wishes and messages.